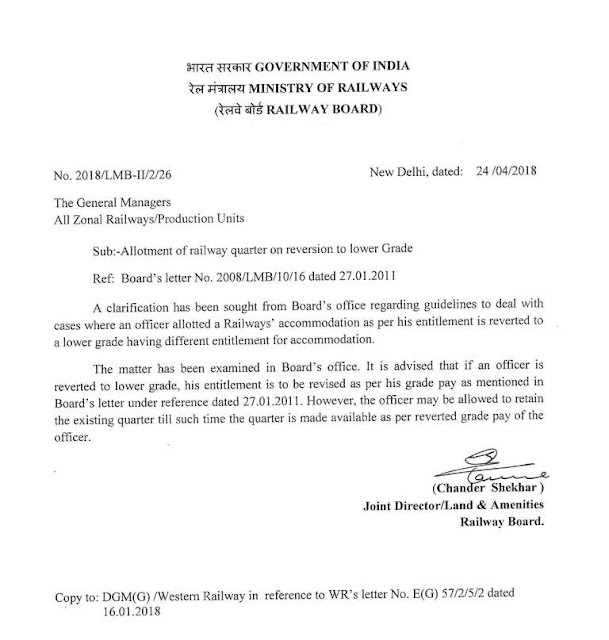 A clarification has been sought from Board's office regarding guidelines to deal with cases where an officer allotted a Railways' accommodation as per his entitlement is reverted to a lower grade having different entitlement for accommodation. The matter has been examined in Board's office. It is advised that if an officer is reverted to lower grade, his entitlement is to be revised as per his grade pay as mentioned in Board's letter under reference dated 27.01.2011. However, the officer may be allowed to retain the existing quarter till such time the quarter is made available as per reverted grade pay of the officer.